An Earthquake is a shaking of the ground caused by the sudden breaking and shifting of large sections of Earth's rocky outer shell. Earthquakes are among the most powerful events on earth, and their results can be terrifying. A severe earthquake may release energy 10,000 times as great as that of the first atomic bomb. Rock movements during an earthquake can make rivers change their course. Earthquakes can trigger landslides that cause great damage and loss of life. Large earthquakes beneath the ocean can create a series of huge, destructive waves called tsunamis (tsoo NAH meez)that flood coasts for many miles. Earthquakes almost never kill people directly. Instead, many deaths and injuries result from falling objects and the collapse of buildings, bridges, and other structures. Fire resulting from broken gas or power lines is another major danger during a quake. Spills of hazardous chemicals are also a concern during an earthquake. The force of an earthquake depends on how much rock breaks and how far it shifts. Powerful earthquakes can shake firm ground violently for great distances. During minor earthquakes, the vibration may be no greater than the vibration caused by a passing truck. On average, a powerful earthquake occurs less than once every two years. At least 40 moderate earthquakes cause damage somewhere in the world each year. Scientists estimate that more than 8,000 minor earthquakes occur each day without causing any damage. Of those, only about 1,100 are strong enough to be felt. 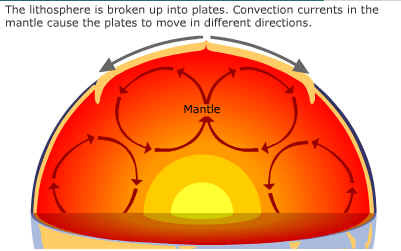 This article discusses Earthquake (How an earthquake begins) (How an earthquake spreads) (Damage by earthquakes) (Where and why earthquakes occur) (Studying earthquakes). Most earthquakes occur along a fault -- a fracture in Earth's rocky outer shell where sections of rock repeatedly slide past each other. 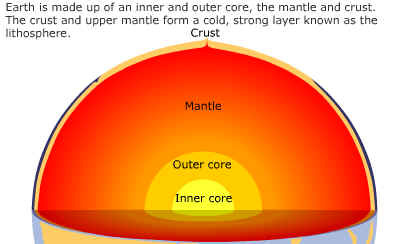 Faults occur in weak areas of Earth's rock. Most faults lie beneath the surface of Earth, but some, like the San Andreas Fault in California, are visible on the surface. Stresses in Earth cause large blocks of rock along a fault to strain, or bend. When the stress on the rock becomes great enough, the rock breaks and snaps into a new position, causing the shaking of an earthquake. 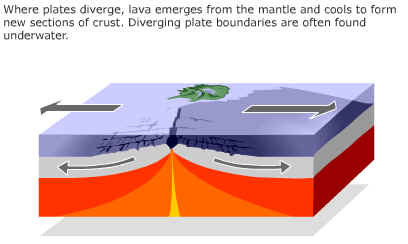 Earthquakes usually begin deep in the ground. 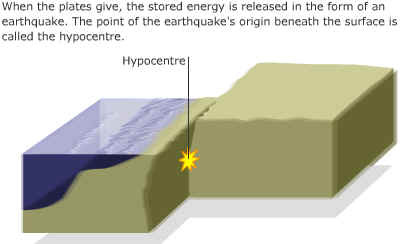 The point in Earth where the rocks first break is called the focus, also known as the hypocenter, of the quake. The focus of most earthquakes lies less than 45 miles (72 kilometers) beneath the surface, though the deepest known focuses have been nearly 450 miles (700 kilometers) below the surface. 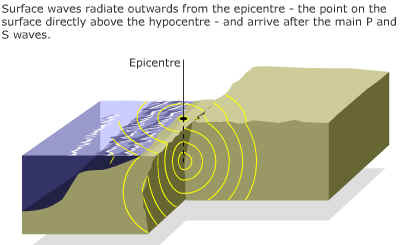 The point on the surface of Earth directly above the focus is known as the epicenter of the quake. The strongest shaking is usually felt near the epicenter. From the focus, the break travels like a spreading crack along the fault. 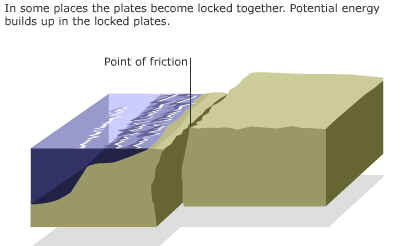 The speed at which the fracture spreads depends on the type of rock. It may average about 2 miles (3.2 kilometers) per second in granite or other strong rock. At that rate, a fracture may spread more than 350 miles (560 kilometers) in one direction in less than three minutes. 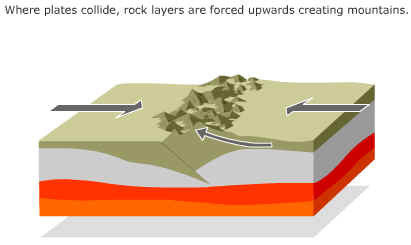 As the fracture extends along the fault, blocks of rock on one side of the fault may drop down below the rock on the other side, move up and over the other side, or slide forward past the other. When an earthquake occurs, the violent breaking of rock releases energy that travels through Earth in the form of vibrations called seismic waves. Seismic waves move out from the focus of an earthquake in all directions. As the waves travel away from the focus, they grow gradually weaker. For this reason, the ground generally shakes less farther away from the focus. There are two chief kinds of seismic waves: (1) body waves and (2) surface waves. Body waves, the fastest seismic waves, move through Earth. Slower surface waves travel along the surface of Earth. Body waves tend to cause the most earthquake damage. There are two kinds of body waves: (1) compressional waves and (2) shear waves. As the waves pass through Earth, they cause particles of rock to move in different ways. Compressional waves push and pull the rock. They cause buildings and other structures to contract and expand. Shear waves make rocks move from side to side, and buildings shake. Compressional waves can travel through solids, liquids, or gases, but shear waves can pass only through solids. Compressional waves are the fastest seismic waves, and they arrive first at a distant point. For this reason, compressional waves are also called primary (P) waves. 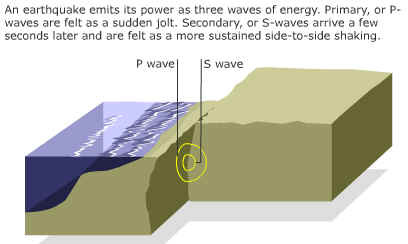 Shear waves, which travel slower and arrive later, are called secondary (S) waves. 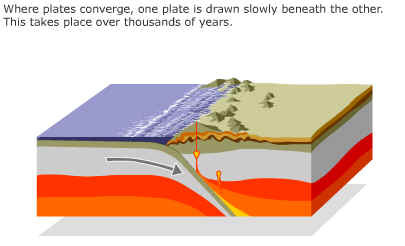 Body waves travel faster deep within Earth than near the surface. For example, at depths of less than 16 miles (25 kilometers), compressional waves travel at about 4.2 miles (6.8 kilometers) per second, and shear waves travel at 2.4 miles (3.8 kilometers) per second. At a depth of 620 miles (1,000 kilometers), the waves travel more than 11/2 times that speed. Surface waves are long, slow waves. They produce what people feel as slow rocking sensations and cause little or no damage to buildings. There are two kinds of surface waves: (1) Love waves and (2) Rayleigh waves. Love waves travel through Earth's surface horizontally and move the ground from side to side. Rayleigh waves make the surface of Earth roll like waves on the ocean. Typical Love waves travel at about 23/4 miles (4.4 kilometers) per second, and Rayleigh waves, the slowest of the seismic waves, move at about 21/4 miles (3.7 kilometers) per second. The two types of waves were named for two British physicists, Augustus E. H. Love and Lord Rayleigh, who mathematically predicted the existence of the waves in 1911 and 1885, respectively. 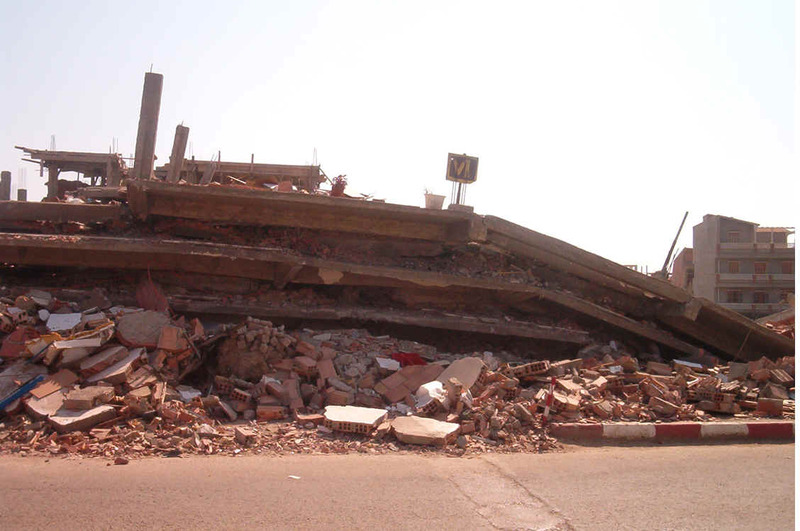 A destructive earthquake of magnitude Mw = 6.8 hit the region of Boumerdes and Algiers (Algeria) on May 21, 2003. This is among the strongest seismic events of the mediterranean region and the most important event in the capital Algiers since 1716. It caused a widespread damage in the epicentral region, claimed 2271 human lives, injured 10000, about 20000 housing units affected and left about 160000 homeless. The main shock was felt about 250 km far from the epicenter and triggered sea waves of 1-3 m in amplitude in Balearic islands (Spain). Based on field observations and press report an intensity IX (MSK scale) is attributed to the epicentral area. The main shock was followed by many aftershocks among them several are of magnitude greater than 5.0, which added panic to inhabitants. The main shock triggered ground deformation, particularly liquefaction whose features are in different forms and sizes and caused damage and collapse of roads. The focal mechanism determined by worldwide institutions yield a pure reverse faulting with a compressional axis striking NE-SW. The epicenter is located offshore about 7 km from the Boumerdes-Dellys coast. Field observations show 0.7 m of coseismic uplift of shoreline between Boudouaou and Dellys. This uplift is about a half of the extracted coseismic slip from the seismic moment. On the other hand there is no clear surface break onshore, confirming hence, that the causative active fault is offshore. However, the rupture may propagate onshore to the SE near the Boudouaou region where ground cracks showing reverse faulting are observed a long a corridor of about 1 km wide. These fissures may correspond to a diffuse coseismic deformation.Pancake collapse in Kahouat-Chergui, Algeria. Photo Credit: Djillali Benour, University of Bab Ezzour, Algeria. 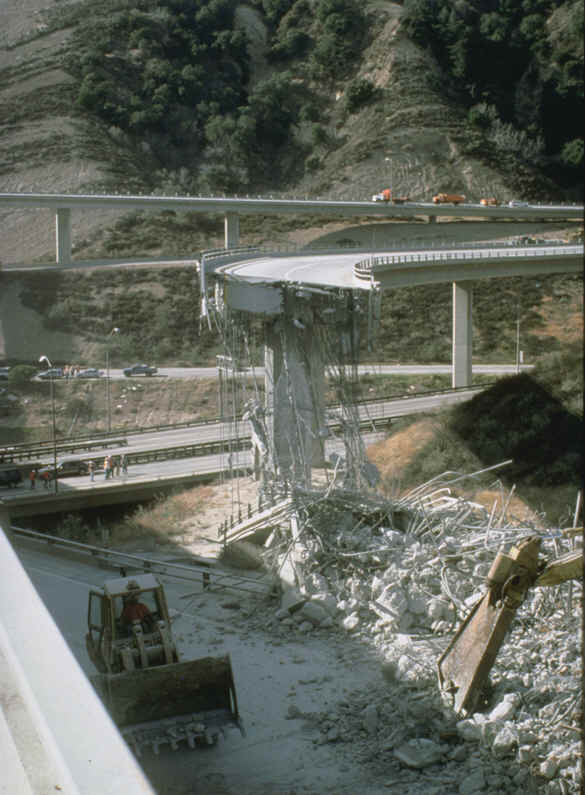 Earthquakes can damage buildings, bridges, dams, and other structures, as well as many natural features. 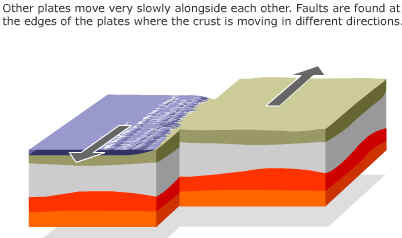 Near a fault, both the shifting of large blocks of Earth's crust, called fault slippage, and the shaking of the ground due to seismic waves cause destruction. Away from the fault, shaking produces most of the damage. Undersea earthquakes may cause huge tsunamis that swamp coastal areas. Other hazards during earthquakes include rockfalls, ground settling, and falling trees or tree branches. The rock on either side of a fault may shift only slightly during an earthquake or may move several feet or meters. In some cases, only the rock deep in the ground shifts, and no movement occurs at Earth's surface. In an extremely large earthquake, the ground may suddenly heave 20 feet (6 meters) or more. Any structure that spans a fault may be wrenched apart. The shifting blocks of earth may also loosen the soil and rocks along a slope and trigger a landslide. In addition, fault slippage may break down the banks of rivers, lakes, and other bodies of water, causing flooding. Ground shaking causes structures to sway from side to side, bounce up and down, and move in other violent ways. Buildings may slide off their foundations, collapse, or be shaken apart. In areas with soft, wet soils, a process called liquefaction may intensify earthquake damage. Liquefaction occurs when strong ground shaking causes wet soils to behave temporarily like liquids rather than solids. Anything on top of liquefied soil may sink into the soft ground. The liquefied soil may also flow toward lower ground, burying anything in its path. An earthquake on the ocean floor can give a tremendous push to surrounding seawater and create one or more large, destructive waves called tsunamis, also known as seismic sea waves. Some people call tsunamis tidal waves, but scientists think the term is misleading because the waves are not caused by the tide. Tsunamis may build to heights of more than 100 feet (30 meters) when they reach shallow water near shore. In the open ocean, tsunamis typically move at speeds of 500 to 600 miles (800 to 970 kilometers) per hour. They can travel great distances while diminishing little in size and can flood coastal areas thousands of miles or kilometers from their source. 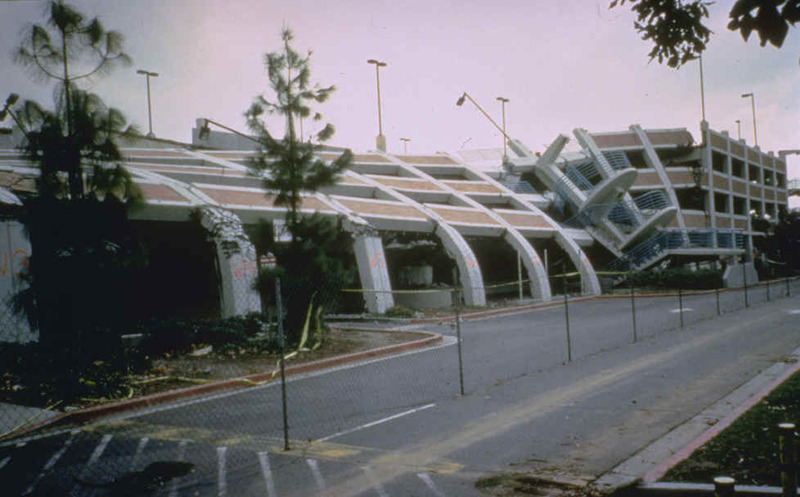 Structures collapse during a quake when they are too weak or rigid to resist strong, rocking forces. In addition, tall buildings may vibrate wildly during an earthquake and knock into each other. Picture San Francisco earthquake of 1906 A major cause of death and property damage in earthquakes is fire. Fires may start if a quake ruptures gas or power lines. The 1906 San Francisco earthquake ranks as one of the worst disasters in United States history because of a fire that raged for three days after the quake. Other hazards during an earthquake include spills of toxic chemicals and falling objects, such as tree limbs, bricks, and glass. Sewage lines may break, and sewage may seep into water supplies. Drinking of such impure water may cause cholera, typhoid, dysentery, and other serious diseases. Loss of power, communication, and transportation after an earthquake may hamper rescue teams and ambulances, increasing deaths and injuries. In addition, businesses and government offices may lose records and supplies, slowing recovery from the disaster. How do scientists measure earthquakes? There are two ways in which scientists quantify the size of earthquakes: magnitude and intensity. Magnitude is a measure of the amount of energy released during an earthquake, and you've probably heard news reports about earthquake magnitudes measured using the Richter scale. Something like, "A magnitude 7.3 earthquake struck Japan today. Details at ten." Did you ever wonder why, if it's that important, they just don't tell you right away? The Richter scale was invented, logically enough, in the 1930s by Dr. Charles Richter, a seismologist at the California Institute of Technology. It is a measure of the largest seismic wave recorded on a particular kind of seismograph located 100 kilometers (about 62 miles) from the epicenter of the earthquake. Think of a seismograph as a kind of sensitive pendulum that records the shaking of the Earth. The output of a seismograph is known as a seismogram. In the early days, seismograms were produced using ink pens on paper or beams of light on photographic paper, but now it's most often done digitally using computers. The seismograph that Dr. Richter used amplified movements by a factor of 3000, so the waves on the seismograms were much bigger than those that actually occurred in the Earth. The epicenter of an earthquake is the point on the Earth's surface directly above the source, or focus, of the movement that causes the quake. Dr. Richter studied records from many earthquakes in southern California, and realized that some earthquakes made very small waves whereas others produced large waves. So, to make it easier to compare the sizes of the waves he recorded, Richter used the logarithms of the wave heights on seismograms measured in microns (1/1,000,000th of a meter, or 1/1000th of a millimeter). Remember, you have to be using a particular kind of seismograph located 100 km from the epicenter when you make the measurement; otherwise, all sorts of complicated calculations have to be made. That's why seismologists spend so many years in college! A wave one millimeter (1000 microns) high on a seismogram would have a magnitude of 3 because 1000 is ten raised to the third power. In contrast, a wave ten millimeters high would have a magnitude of 4. For reasons that we won't go into, a factor of 10 change in the wave height corresponds to a factor of 32 change in the amount of energy released during the earthquake. In other words, a magnitude 7 earthquake would produce seismogram waves 10 x 10 = 100 times as high and release energy 32 x 32 = 1024 times as great as a magnitude 5 earthquake. The Richter scale is open-ended, meaning there is no limit to how small or large an earthquake might be. Due to the nature of logarithms, it is even possible to have earthquakes with negative magnitudes, although they are so small that humans would never feel them. At the other end of the spectrum, there should never be an earthquake much above magnitude 9 on the Earth simply because it would require a fault larger than any on the planet. The largest earthquake ever recorded on Earth was a magnitude 9.5 that occurred in Chile in 1960, followed in size by the 1964 Good Friday earthquake in Alaska (magnitude 9.2), a magnitude 9.1 earthquake in Alaska during 1957, and a magnitude 9.0 earthquake in Russia during 1952. Two large earthquakes, one a magnitude 9.0 and one a magnitude 8.2, occurred on Dec. 26, 2004 and March 28, 2005, respectively, along the same fault zone off the coast of Sumatra, Indonesia. The list of really large earthquakes in the previous paragraph brings up another interesting point. Five earthquakes of magnitude 9 or above have been recorded during the past 45 years, which averages out to one every decade. It turns out that earthquake occurrences seem to follow what is called a power-law distribution, meaning that if there is on average on magnitude 9 earthquake every ten years somewhere in the world, then on average there should be one magnitude 8 earthquake every year, 10 magnitude 7 earthquakes every year, and 100 magnitude 6 earthquakes every year. So, if someone "predicts" that a magnitude 6 earthquake will occur somewhere in the world during the next week, don't be too impressed if it happens because random probability tells us that there should be a magnitude 6 earthquake somewhere in the world every 365/100 = 3.65 days! In reality, things are a little more complicated. But, you get the picture. What did people do before the Richter scale was invented? To some degree, one of the same things that we do today. They observed the intensity or effects of an earthquake at different locations. Whereas the magnitude of an earthquake is a single number regardless of where it's felt, intensity will vary from place to place. In general, the intensity will be much greater near the epicenter than at large distances from the epicenter. This decrease in intensity with distance is known as attenuation. Imagine it this way: If I drop a rock into a pool of water, the difference between magnitude and intensity is similar to the difference between the height of the splash exactly where I drop the rock and the height of the waves all over the pool. Earthquake intensity is most often measured using the modified Mercalli scale, which was invented by the Italian geologist Giuseppi Mercalli in 1902 and uses Roman numerals from I to XII. In the United States, we use the modified Mercalli scale, which was adjusted to account for differences in buildings between Italy and southern California. An earthquake intensity of I is generally not felt, and an intensity of XII represents total destruction of buildings. Some kinds of geologic deposits, most notably water saturated muds, amplify seismic waves and may produce intensities much greater than those for nearby areas underlain by bedrock. Thus, after an earthquake seismologists can interview people and make maps showing the intensity of an earthquake in different areas to better understand the influence of rock or soil type on seismic waves. Instrumental. Not felt except by a very few under especially favourable conditions detected mostly by Seismography. Feeble. Felt only by a few persons at rest, especially on upper floors of buildings. Slight. Felt quite noticeably by persons indoors, especially on upper floors of buildings. Many people do not recognize it as an earthquake. Standing motor cars may rock slightly. Vibration similar to the passing of a truck. Moderate. Felt indoors by many, outdoors by few during the day. At night, some awakening. Dishes, windows, doors disturbed; walls make cracking sound. Sensation like a heavy truck striking building. Standing motor cars rock noticeably. Rather Strong. Felt by nearly everyone; many awakened. Some dishes, windows broken. Un-stable objects overturned. Pendulum clocks may stop. Strong. Felt by all, many frightened. Some heavy furniture moved; a few instances of fallen plaster. Damage slight. Very Strong. Damage negligible in buildings of good design and construction; slight to moderate in well-built ordinary structures; considerable damage in ordinary structures; considerable damage in poorly built or badly designed structures. Destructive. Damage slight in specially designed structures; considerable damage in ordinary substantial buildings with partial collapse. Damage great in poorly built structures. Fall of factory stacks, columns, monuments, walls. Heavy furniture overturned. Ruinous. Damage considerable in specially designed structures; well designed frame structures thrown out of plumb. Damage great in substantial buildings, with partial collapse. 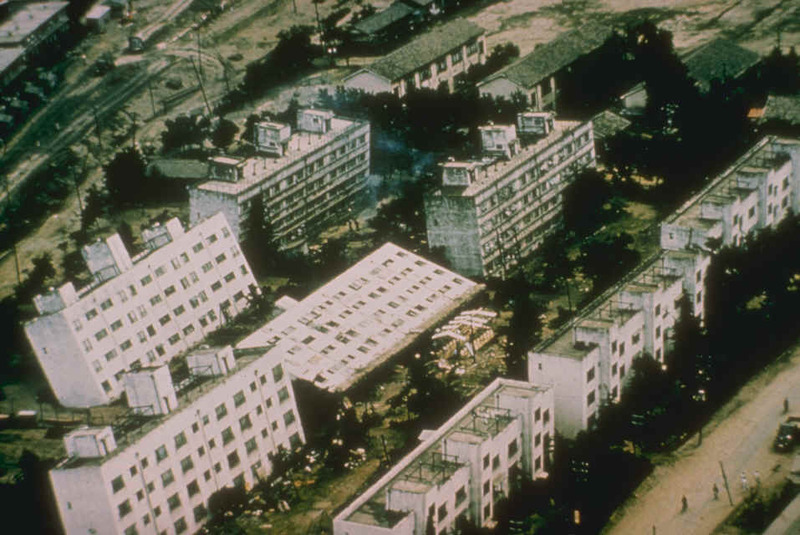 Buildings shifted off foundations. Disastrous. Some well-built wooden structures destroyed; most masonry and frame structures destroyed with foundations. Rails bend greatly. Very Disastrous. Few, if any (masonry) structures remain standing. Bridges destroyed. Rails bend greatly. XII Catastrophic. Damage total. Lines of sight and level are distorted. Objects thrown into the air.